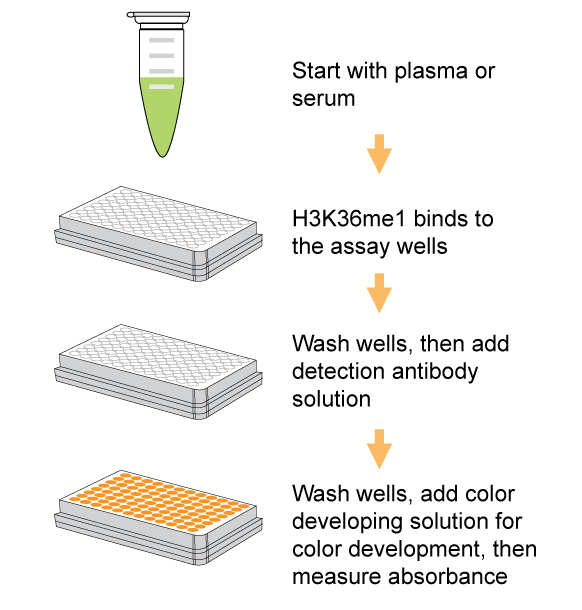 Schematic procedure of the EpiQuik™ Circulating Monomethyl Histone H3K36 ELISA Kit (Colorimetric). Histone extracts were prepared from HL-60 cells using the EpiQuik™ Total Histone Extraction Kit (Cat. #OP-0006) and spiked into bovine plasma at different concentrations. 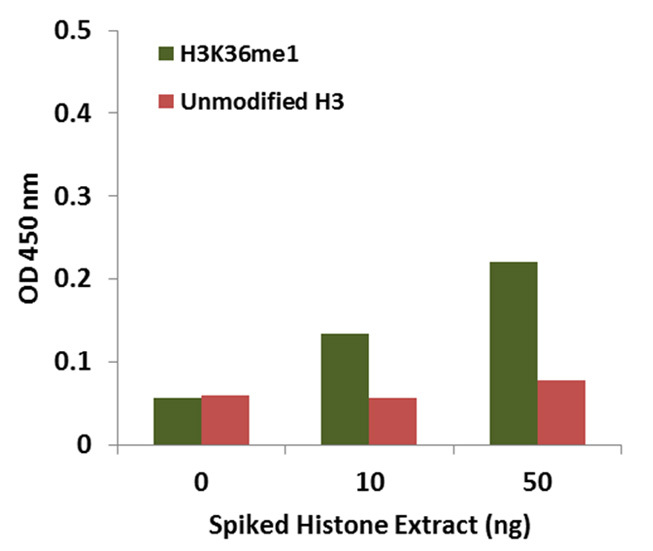 The amount of H3K36me1 was measured using the EpiQuik™ Circulating Monomethyl Histone H3K36 ELISA Kit (Colorimetric). High sensitivity and specificity. The detection limit is as low as 0.5 ng/well with dynamic range of 1-20 ng/well within the indicated amount range of the plasma/serum. Only recognizes H3K36me1 with no cross-reactivity with unmodified H3 or other modifications at the same lysine site. The control is conveniently included for the quantification of H3K36me1. Epigenetic activation or inactivation of genes plays a critical role in many important human diseases, especially in cancer. A major mechanism for epigenetic gene inactivation is methylation of CpG islands in genomic DNA caused by DNA methyltransferases. Histone methyltransferases (HMTs) control or regulate DNA methylation through chromatin-dependent transcriptional repression or activation. HMTs transfer 1-3 methyl groups from S-adenosyl-L-methionine to the lysine and arginine residues of histone proteins. NSD1 is the major histone methyltransferase that catalyzes monomethylation of histone H3 at lysine 36 (H3K36) in mammalian cells. JHDMs are the major histone demethylases that demethylates H3K36me1. H3K36me1 has been viewed as a signature mark of transcription activation genes, which is placed exclusively in the 5’- region downstream of the promoter. The H3K36me1 can also be changed by inhibition or activation of HMTs. Circulating histone H3K36me1 in plasma or serum has been observed and demonstrated as the marker for many different diseases or pathological changes such as cancer progression. Therefore, detection of circulating H3K36me1 would provide useful information for a better understanding of epigenetic regulation of gene activation and silencing, histone modification-associated pathological processes, screening of disease-related biomarkers, as well as for developing histone modification-targeted drugs. This kit is designed for measuring total H3K36me1 in plasma or serum. In an assay with this kit, the Histone H3 proteins monomethylated at K36 in the plasma/serum sample are captured on the strip wells coated with anti-H3K36me1 antibody. The captured H3K36me1 proteins can be then recognized with detection antibody followed by a color development reagent. 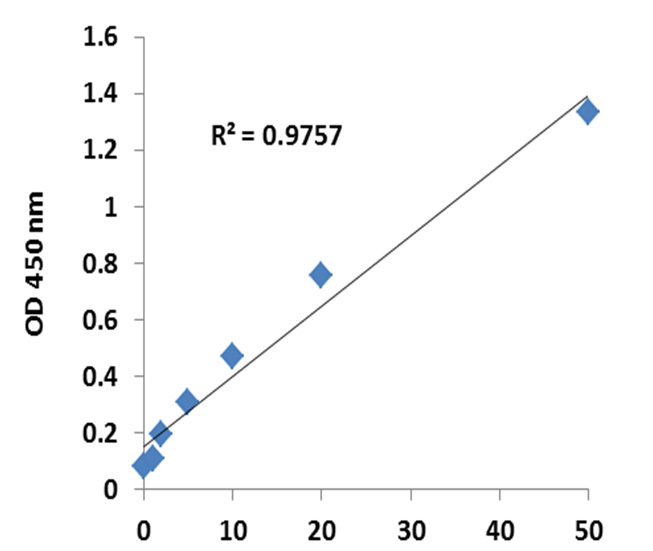 The ratio of H3K36me1 is proportional to the intensity of absorbance. The absolute amount of H3K36me1 can be quantitated by comparing to the standard control. Input materials should be plasma or serum. The amount of plasma or serum for each assay can be 10 to 40 µl with an optimal amount of 30 µl. #Control Assay Strips are green trimmed for distinguishing from 8-well Assay Strips (for samples). The Control Assay Strips are only for control use and should not be used for sample assay.